I have been waiting (not so patiently) for all the details on the 25th Lexington NC Barbecue Festival. This is a milestone year, and I'm sure it's going to be extra special. So, I've watched the Barbecue Festival web page to see what all is going on this year. The new information went up this week, and also got an email from Greta who is working on getting the word out about this top rated Barbecue street party. The big news this year is that Lee Ann Womack is headlining. She is probably most known for her song "I Hope You Dance" which appealed to a cross section of music fans including pop and her country music fan base. Other stars playing for 2008 include Adam Gregory, Randy Houser, and Jamie Johnson. There are always lots of great local groups ranging from jazz to beach music and even performers like a magician. In addition to the main stage, there are various smaller stages set up and down the street, so it's easy to find some good music or someone telling stories. I'd also note that Sponge Bob will be making appearances this year which will really excite a lot of the kids. You can guess the theme of the Barbecue Festival in Lexington. 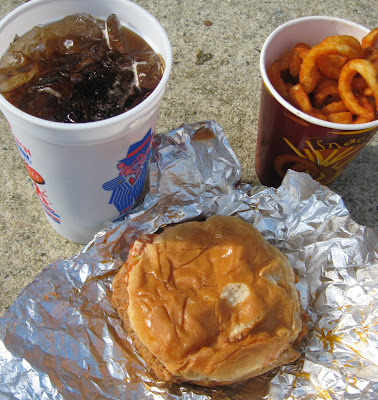 They serve the famous Lexington BBQ which is chopped pork on a bun. The sauce is vinegar based with a little hot pepper and has some zing but not so much that it freaks out those who can't handle hot foods. Just a nice little burst of flavor. In the South, most people eat barbecue pork with slaw. It's a red slaw. Again, it has more zip than more traditional slaws. It also makes the buns a little soggy, so some people love and some do not. You can ask for it either way - with or without slaw. There's more food than you can shake a stick at at the Barbecue Festival, so arrive hungry. 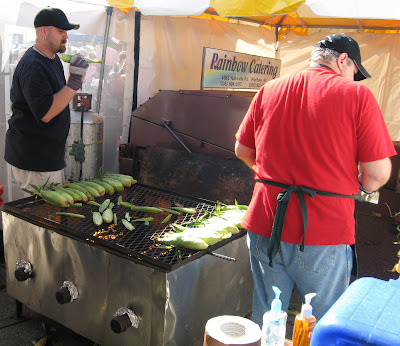 In addition to the fabulous barbecue, you can get other Southern favorites like grilled corn on the cob, fried pork rinds, and fried apple pies. North Main Street in Lexington is always lined with double rows of booths. Many of these include arts and crafts. You can find cool things that you'd not find at the mall. 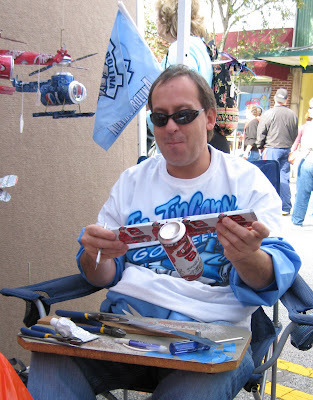 One of my favorite booths is the Tin Can Man booth. He makes airplanes and other items like ships out of aluminum cans. He even makes them while you watch. Tell him that writer Cyndi said "hi" if you see him. I always enjoy some of the sample booths. There are mixes you can buy. They usually have pretzels, and you can try various cheese dip mixes. I stock up every year and have those for the holidays. I also buy new hot sauces, since small vendors have different homemade sauces to sell. They also offer samples usually. Those range from the NC style with a vinegar base to tomato based to mustard (from SC). Some small town festivals are really small town. You only have a few things to see and do. That's not the case in Lexington. It's huge - really. They expect 10,000 this year, and the town has a population of a little over 20,000. 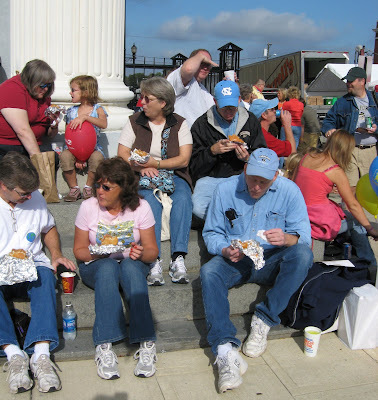 The Barbecue Festival consistantly makes the top ten list for festivals in the southeast and has also been mentioned by USA Today and Travel & Leisure magazine. Of course, everyone around these parts know it's a great day! The festival is on Saturday October 25, 2008. The booths open up at 8:30 and the barbecue tents at 10 a.m. I suggest shooting for 9 a.m. or earlier, because it gets really crowded as the day goes along. And, the bus lines get long. Since the town really is small, it works out better to park and shuttle in. We always park at the Wal-Mart Super Center off I85 (exit 91). They also have parking at Childress Vineyards on US Highway 64 and the Davidson County governmental complex on N. Main Street. The shuttles run every 15 minutes or so, and the drivers are real friendly. Bus tickets are $2 but free for kids under 12. There's enough to keep you busy all day and lots of food to keep you going. This year, they'll close down from 6 p.m. and set up for the 25th celebration complete with fireworks to cap off the quarter century mark. It doesn't cost a thing to get into the festival. Free for all. If you're not familiar with Lexington, NC, then it's 20 miles South of Winston-Salem, NC, 30 miles from Greensboro and 45 miles from Charlotte. wow..i'm already hungry just by watching the photos. The food is great at the festival. The sandwich in the photo is with slaw. That makes the bun kind of soggy. I prefer without slaw. That is so NOT southern. But, I do not like drippy. Someone else ordered last time and got us all "with slaw." Bummer. The fried apple pies are fabulous too. Lines are long though, so get one early or wait quite a while. Worth it though. They remind me of my Grandma's fried apple pies. Super yum.